A new study has shown that prairie voles may be a useful model in understanding the neurochemistry of social behavior. By influencing early social experience in prairie voles, researchers hope to gain greater insight into what aspects of early social experience drive diversity in adult social behavior. 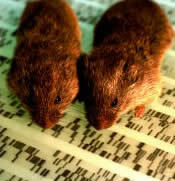 Prairie voles are small, highly social rodents that often form stable, life-long bonds between mates. In the wild, there is striking diversity in how offspring are reared. Some pups are reared by single-mothers, some by both parents (with the father providing much of the same care as the mother) and some in communal family groups. Researchers Todd Ahern, a graduate student in the Emory Neuroscience Program, and Larry Young, PhD, professor of psychiatry and behavioral sciences at the Yerkes National Primate Research Center and Emory School of Medicine, compared pups raised by single mothers (SM) to pups raised by both parents (BP) to determine the effects of these types of early social environments on adult social behavior. The study showed SM- and BP-reared animals experienced different levels of care during the neonatal period and that these differences significantly influenced bonding social behaviors in adulthood. Pups raised by single mothers were slower to make life-long partnerships, and they showed less interest in nurturing pups in their communal families. Researchers also found differences in the oxytocin system. Oxytocin is best known for its roles in maternal labor and suckling, but, more recently, it has been tied to prosocial behavior, such as bonding, trust and social awareness. Very simply, altering their early social experience influenced adult bonding. Further studies will look at the altered oxytocin levels in the brain to determine how these hormonal changes affect relationships.